Australia's seasoned pacer, Mitchell Starc, is set to miss the forthcoming ODI and T20I series against the mighty Indians owing to an injury setback. According to various reports, the fast bowler has nursed a soft tissue injury in his upper body. The injury also puts his place in the national squad for the ODI series against Pakistan in jeopardy. 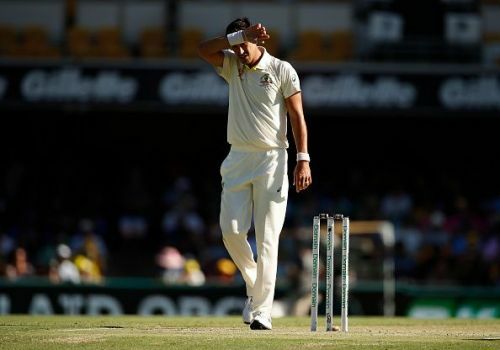 Starc has been beset with a host of injuries throughout his career, but this soft tissue injury could be the worst-ever, as he had just started to find his feet again. Not only has this mishap jeopardized his preparations, but also his rich vein of form. After a rather substandard display against India in the recently concluded series, Starc led from the front in the second Test against Sri Lanka at Canberra, notching a 10-fer and taking home the man of the match award as Australia registered a massive victory by 366 runs. Starc had been recording the express pace he's known for, but the inability to bowl long spells and maintain a consistent heat map while bowling meant that Australia's spearhead wasn't as lethal as he's regarded to be. But now, the Aussies will have to deal with a double blow, as their top two fast bowlers are sidelined. Earlier, Josh Hazlewood had endured a back strain against India as well. However, the five-time World Cup winners are ready to recall Steve Smith into the squad soon, as the former captain is deemed fit for the IPL, World Cup and the Ashes. "Until the brace comes off we don't know for sure but all current opinion is that he'll then have about three and a half weeks (before being ready to play). The intent is that he will play in the IPL and then the World Cup and then the Ashes." The highly anticipated series between India and Australia is to begin on 24 February, with the shortest format of the game to be played first, followed by 5 ODIs.